It all starts when Jared Grace finds their great uncle's book, 'Arthur Spiderwick's Field Guide to the Fantastic World Around You' and the Grace kids realize that they are not alone in their new house. Now the kids want to tell their story but the faeries will do everything they can to stop them. This was such a fun little book! Short and sweet, quirky and magical, loved it! I've always been a fan of anything to do with fairies and folklore, so I'm definitely pumped to delve more into this exciting world! I might be out of the target age range for this series just a wee bit buuuuut better late than never. I like this book for kids (8-11). It's spooky at times as you follow two twin boys and their sister in a creepy, old house. Enjoy! Very cute! I can see why kids like them. I'm sure I'll end up buying the complete set for mine! A fun and quick read. This had everything a children's book should have: imagination. This was really great! Uno de esos libros entrañables que se pueden leer a cualquier edad, muy bien escrito, sencillo y ameno, y con ese ambiente de fantasía y magia, en una casa misteriosa, tan maravilloso. Me ha gustado mucho, no podía parar de leer. 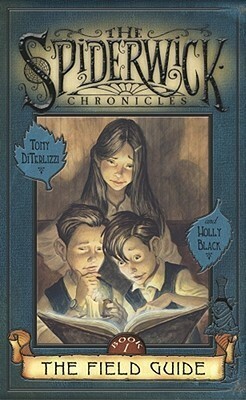 Debo decir, sin vergüenza alguna, que soy muy fan de la película Las Crónicas de Spiderwick. Es por eso mismo que he decidido leer los libros. De momento la cosa me está gustando bastante. Las ilustraciones le dan un toque fantástico a la historia. Ya explicaré qué me ha parecido la saga en general en el último tomo, puesto a que son bastante cortitos, y no creo que tarde mucho en leerlos todos. Awesome! Can't wait to continue.